Chivas' player injured RSL's Morales with tackle from behind. 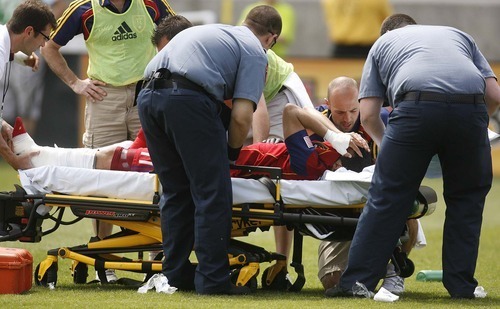 Trent Nelson | The Salt Lake Tribune Real Salt Lake's Javier Morales is taken from the field after a horrific injury during a match against Chivas USA at Rio Tinto Stadium in Sandy on May 7. 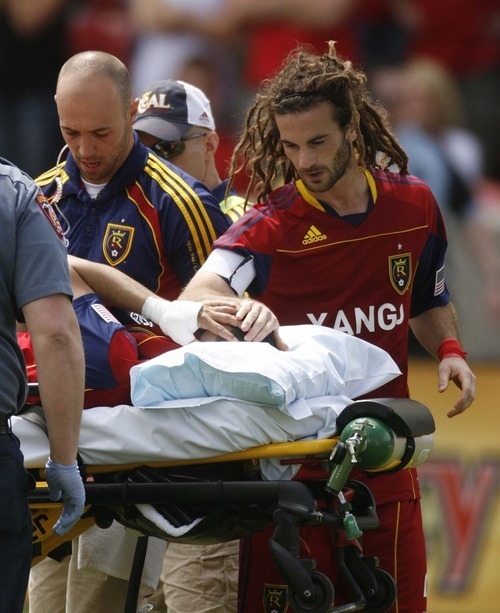 Trent Nelson | The Salt Lake Tribune Real Salt Lake's Kyle Beckerman offers a hand of support to injured teammate Javier Morales on May 7. Trent Nelson | The Salt Lake Tribune Real Salt Lake's Javier Morales falls with a horrific injury on last Saturday during a match against Chivas USA at Rio Tinto Stadium in Sandy. Trent Nelson | The Salt Lake Tribune Real Salt Lake's Javier Morales falls with a horrific injury, with Chivas USA's Marcos Mondaini defending on May 7. The player whose late tackle from behind ravaged the left ankle of Real Salt Lake's Javier Morales has been suspended a total for four games and fined $1,500, Major League Soccer confirmed Thursday. Forward Marcos Mondaini of Chivas USA will miss three extra games beyond the automatic one-game suspension he was due for being ejected with a red card for his tackle on Morales in the 38th minute of a 1-0 RSL victory at Rio Tinto Stadium last Saturday. He also was fined an additional $1,250, beyond the automatic $250 fine that comes with a red card, confirming a report from ESPN 700 Radio on Wednesday. "The Disciplinary Committee determined that Mondaini's tackle was reckless and endangered the safety of his opponent," the league said in a statement. The suspension means Mondaini will be eligible to return against the Portland Timbers on June 4, while Morales is expected to be out at least four months after surgery to repair two broken bones, a dislocation and torn ligaments in his left ankle. Many fans have reacted angrily that Mondaini was not punished as harshly as Colorado's Brian Mullan, who broke the leg of Seattle's Steve Zakuani with a vicious tackle last month and was suspended a total for 10 games and fined $5,000. But league officials said the two incidents were markedly different. "During its discussions, the committee characterized Mondaini's tackle as late, clumsy, and from behind," said Nelson Rodriguez, the league's executive vice president of competition, technical and game operations. "It was also, however, seen as an attempt to prevent his opponent from scoring. Brian Mullan's tackle on Steve Zakuani last month did not serve such a purpose. Rather, it showed utter disregard for his opponent's safety and appeared to be driven by anger." Real Salt Lake broke ground Thursday on a new practice field near Rio Tinto Stadium to replace the one in Lehi that it has used the past few years. Team officials plan to build the field at 10000 South and State Street on land they have leased for five years from its owner, America First Credit Union. The field will be called America First Field, they said, but it's not expected to be ready until next summer. The new location near the stadium will be more convenient for coaches and players and provide them a flatter field on which to practice. The Xango Field site in Lehi is slightly crowned.